The droplet breakup and the bubble collapse are typical flow phenomenon involving complicated pressure and density variation as well as interface evolution. 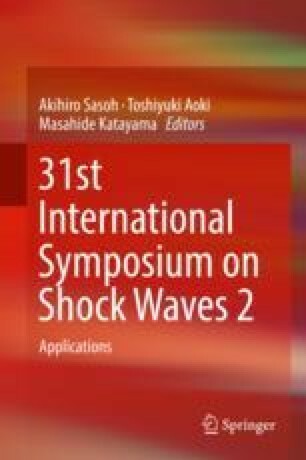 In this paper, the numerical simulation of a planar shock wave interacting with an acentric water ring is studied. In order to simulate the spatiotemporal interface evolution of the water ring impinged by a planar shock wave, a quasi-conservative interface capturing method is employed, in which the governing equations consist of the conservative Euler equations and the scalar transportation equations, together with the stiffened gas equation of state of the two phases. An incremental stencil adapted WENO scheme with fifth order in the smooth regions is employed for the spatial reconstruction. The numerical results show that the bubble collapses under different incident Mach number shock waves due to the strong pressure gradients. The strong transverse jets form because of the Richtmyer-Meshkov instability. The jet tip and its impaction on the downward wall of the cavity are extracted by analyzing the isolines ofγrepresenting the two-phase interface. The jet tip speed and the pressure at the impaction point nonlinearly increase with the incident shock wave strength.